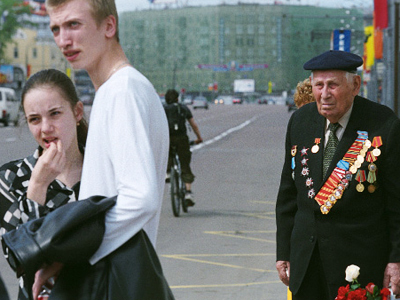 Not everyone regards Victory Day as a cause for celebration. In Western Ukraine, nationalist party members have violently disrupted a memorial service as veterans paid tribute to those who perished in the war. A holiday for millions, but a street brawl for others. 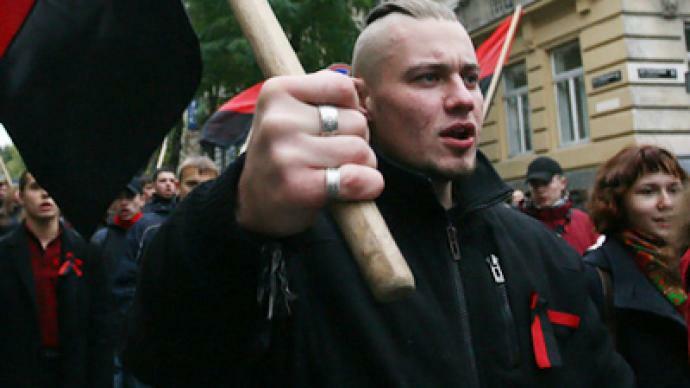 Unlike most of the post-Soviet region on May 9th, the western Ukrainian city of Lvov became a vicious display of neo-Nazism. Several thousand activists from radical nationalist parties blocked the entrance to Red Army soldiers’ cemeteries, preventing war veterans from getting inside and paying tribute. Some in this part of Ukraine do not see May 9th as a reason to celebrate, believing the Soviet period to be worse than enduring Nazi occupation. 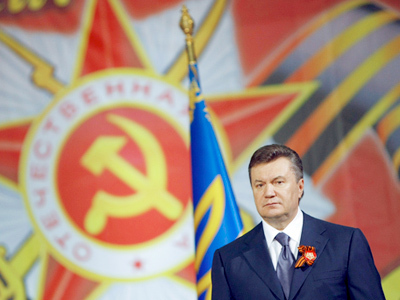 The St. George’s ribbon is traditionally worn on Victory Day to commemorate those who died in the Great Patriotic War. However, putting it on your lapel on this day in Lvov would have constituted a serious risk – regardless of whether you were a veteran or not. The ribbons were forcibly ripped from the chests of those who were heading to the graveyards. Those who simply wished to pay tribute and to show their respect were also bombarded with abusive chants such as “death to the Muscovites”, Nazi salutes, rocks and smoke bombs. That’s how Lvov marked May 9th. Activists of the Liberty nationalist organization put up fierce resistance to the police, stoning police buses carrying reinforcements, throwing smoke grenades and shaking the fence around the Hill of Glory, where some 100 people, among them World War II veterans, had gathered for a commemorative ceremony. Such scenes surprised even the locals, who had grown used to protests on Victory Day, with nationalists wiping their feet on the red victory banner. Their heroes are people regarded worldwide as Nazi collaborators. Replica shirts depicting Stepan Bandera and Roman Shukhevich, the founders of the 1940s insurgent army, are a big hit here. They are seen as freedom fighters, even though for a while they fought alongside the Nazi army and killed civilians, Jews and Russians in a gruesome manner. “Actions like these are an attempt to write off the sacrifices the country made to be liberated from the Nazis and a result of pro-fascist propaganda, like the rehabilitation of Nazi collaborators, like Shukhevich and Bandera,” says Vadim Kolesnichenko, a deputy in Ukraine’s Rada. This is only a part of a wider picture. 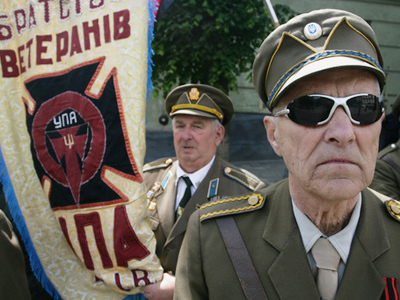 A warped perception of the past is making waves in other former Soviet states, namely in the Baltic states Latvia and Estonia, where SS marches glorifying Nazi legions are not uncommon. As a Russian diplomatic delegation was on its way to the Hill to pay tribute to those who perished during the war, a group of nationalists grabbed a wreath which Oleg Astakhov, Russia’s Consul General, was to lay at the military cemetery. "The wreath I was to lay at the Hill of Glory memorial at the military cemetery was shredded to pieces," he said in an interview with the ZIK magazine according to Interfax. 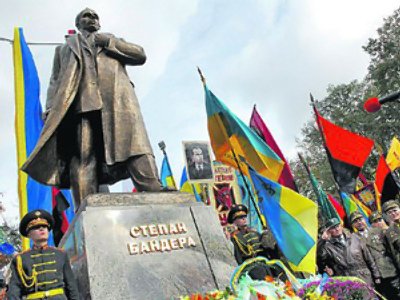 Today’s events in Western Ukraine are part of a common trend for some corners of the former Soviet Union, such as the Baltic States, where rewriting of the common history has been widely instigated and Victory Day, therefore, is not celebrated. Supporters of such views claim that the Soviet period was worse than the Nazi occupation. Nonetheless, the scale of Lvov’s Monday violence is unprecedented even by local standards. 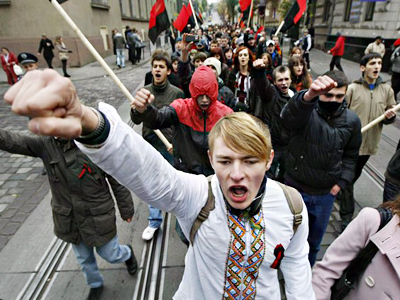 With all that, such views, even though common in Lvov, do not dominate Ukrainian society. Most of the country is celebrating the holiday and remembers millions of those who died liberating their country from Nazi Germany. Moscow expects Ukrainian authorities to bring nationalists to account for attacking veterans during a memorial service on May 9. ­Ukraine is a very diverse nation because for the first time in its history Ukraine united in 1939 as a republic of the Soviet Union, said Dmitry Babich from Russia Profile magazine. To begin preventing Nazi-loving nationalism in Western Ukraine, the attitude of the Western media towards Ukrainian nationalism should first of all change, shared Babich. Unfortunately, a part of the Western press encourages the opinion that at one time Hitler could have been better than Stalin and it resents the Soviet past in former Soviet republics. Russian historian Leonid Dobrokhotov has told RT why, in his opinion, these attempts to rewrite history take place in some of the former Soviet republics. After WWII, the nationalist movements were suppressed in the Soviet Union, Dobrokhotov continued. However, decades later, when the USSR was disintegrating, the West strongly supported the independence of those republics from Russia. Now, the West still regards these former parts of the Soviet Union as its close allies and turns a blind eye to the Nazi tendencies that occur there, the historian concluded. ­Glyn Ford, National Treasurer of the Anti-Nazi League, agrees that similar tendencies are common throughout Europe these days. “You are seeing the emergence of far-right parties almost all the way across the European Union, apart, possibly, from those countries that have been inoculated a little by their own experiences, in Spain and Portugal,” he added. “The danger is, if we forget, we are likely to, if you want, replicate it again in the future,” Glyn Ford warned. ­“We have seen this before,” says Cornelius Schwarzler of the Austrian Holocaust Memorial Service.